AVI videos are of high quality but large file size. Therefore many AVI videos are too large to be uploaded to online sites or sent from Emails. This post will show you how to reduce the size of AVI videos without losing video quality. Hi I would like to compress AVI file created from MATLAB. I have to extract audio samples and video frames separately, process them and synchronize them. I have processed the video frames using VideoWriter Command. The resulting file was 175 mb which runs less than a minute. Can you please let me know if there are any commands to make it smaller, or convert it to MPG ? With no further explanation, AVI files employ old video codec - M-JPEG with compression rate lower than H.264/MPEG-4, not to mention the latest H.265/HEVC codec. Thus, AVI size reduction makes sense because AVI files take up more space than MP4 or other file formats. Here top 4 ways to shrink AVI files are listed for your convenience, in view of numerous people demanding on less space occupation and unnecessary expenditure on additional storage and bandwidth charges while uploading to YouTube or so. Keep in mind you should probably start with the basics: concern for the degree of video quality loss after shrinking AVI and stress on the choice of a proper AVI compressor software to reduce AVI file size. Compress Large AVI File to Smaller Size without Losing Quality! Are you still struggling with keeping your video in HEVC codec or re-encoding it to H.264? Free download the H265/HEVC converter to transcode any video to HEVC for smaller size or convert HEVC to H.264, MP4 etc. for better compatibility. Just try it right now! I would like to inform you that the compression of AVI video via adjusting parameters will sacrifice some quality of AVI file. If you are pursuing good quality, just move to the next step to downsize AVI with no quality loss. ① It doesn't take a genius to know that the higher the resolution, the sharper the picture, but also the larger the file size will be. So you can lower the AVI resolution, for example from 1080p to 720p, to shrink AVI file size to about 2/5 of the original. And you also can downscale 4k to 1080p. ② The second way to downsize AVI file is to decease the bitrate, because lowering the bitrate will directly lead to the downsize of AVI file. Bear in mind lower too much bitrate will lead to quality loss. You'd better to keep bitrate between 1400 and 2000 kbps. ③ Frame rate has a big effect on the file size, too. 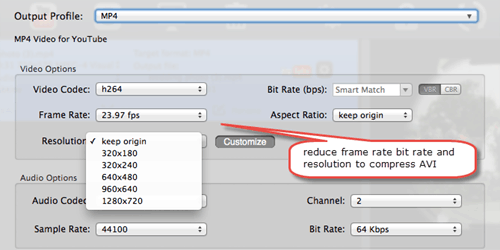 Lower the frame rate of AVI video to 10-15 fps can reduce AVI file size by half to 2/3. There's something you need to know that cutting down frame rate will affect the smoothness of AVI playback. AVI codecs can greatly decrease AVI size to smaller while maximizing the quality. You can choose from various codecs from difference sources. But what matters is your audience must have codec the same as to the codec you use so as to uncompress and view AVI. For the widest compatibility, you can use Cinepak as AVI codec. While for good reduction and high quality, taking Xvid as your video size converter is a good choice. Compared to AVI, MP4, WMV and FLV provides good quality with extremely small file sizes. MP4 is famous for wide compability with media players, mobile sand tablets. WMV is a popular choice for video email and storage on a PC. While FLV is the best format for web video apps. So it's advised to compress AVI to MP4, WMV, FLV, or other small sized format as per your needs with the aid of an AVI video converter. For this purpose, there are vlc to resize avi to mp4, ffmpeg avi to mp4, Handbrake and more. Take advantages of an AVI editor to keep your desired part and delete the pointless segment. Plus, you can crop your AVI video to remove the unwanted area, thus reducing AVI video easily. MacX Video Converter Pro is a solid AVI video compression software, coupled with a solid video converter and online video downloader, capable of downloading and converting AVI to MOV, MP4, WMV, MKV, AVCHD, etc with smaller size, so that you can email or share it on YouTube or play on various devices, see iPhone, iPad, Samsung, Android mobiles and more. 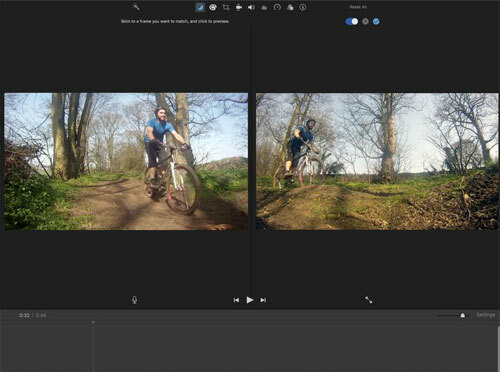 On top of that, it is an awesome video editor, which can edit AVI video, cut off unwanted part and trim the video to reduce AVI file size with ease. All these AVI video processing tasks can be finished within mins even shorter thanks to the Intel QSV/Nvidia/AMD hardware acceleration tech aids (5X faster than any other AVI video resizer). Check the steps below to learn how to compress video files. Step 1: Free download the AVI resizer on your Mac or Windows version for PC, install and run it. Hit the "Add File" button to load AVI video you want to compress. Step 2: Choose the output format with size smaller than AVI, like MP4, WMV or FLV from the drop-down window. Step 3: Adjust the parameters like Frame rate, bitrate and resolution to slim down AVI file on this video resolution converter. Please bear in mind, excessive reduction of the parameters will bring about quality degradation. This program keeps good balance between the file size and image quality. You can simply leave the parameter settings unchanged after choose the output format. Step 4: Hit the "Edit" button to shrink AVI. 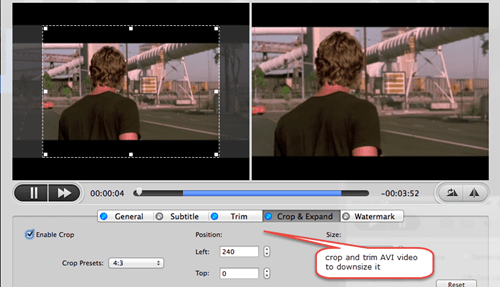 You can check "Enable Crop" box to adjust the crop area size or check "Enable Trimming" box to get your desired part of the AVI video by setting the start time and end time. Step 5: Click the "Browse" button to save the output file and hit "RUN" button to start to compress AVI file on your computer. The same method applies to downsize MOV files, MKV files, MP4 files and more HD videos for uploading to YouTube. 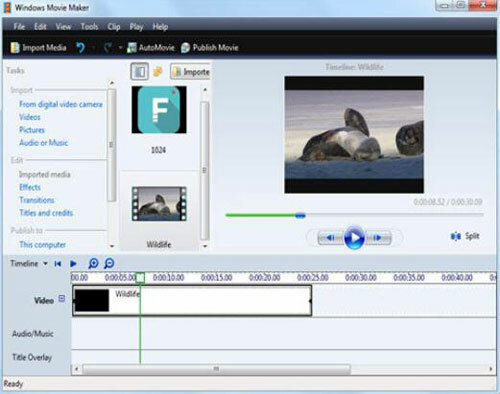 Windows movie maker: This is a famous tool to shrink AVI video files so as to upload AVI to a website or send via email. Just follow the steps to do the compression of AVI file. 1. Open the Windows movie maker and hit the "Import video" on the left pane to select the AVI files. 2. Drag the AVI video to the timeline. 3. Go to the File and select "Save Movie File". 4. After you select a location in your PC, you come to the video setting page, check the box "other settings" and select "Video for broadband (150 kbps)" option that give the most compressed video in the dropdown option. 5. Hit "Next" to start reducing AVI video file. iMovie: iMovie is the default video editing program for Mac OS X only. You can make AVI much smaller by merging, splitting, cropping and rotating the file with this AVI editing tool. 1. Launch the iMovie. Select "New" from the "File" menu at the top window. 2. Name the resized AVI, hit "Where" to choose output folder & click "Create". 3. Hit "Import" from the "File" and "Open" the AVI files. Select "Export" from the "File" and hit the "QuickTime" icon. 4. Select either the "Email" that outputs poor video quality but smallest AVI file size or "Web" that retain good quality but a slightly larger file size from the drop up window "Compress Movie For". 5. Select "Share" button and hit "Save" to start the AVI compression process. Compress large AVI video files to 40%- 98% smaller with high quality reserved. World's No.1 fast speed.